Rolled threads are formed by passing the bar material between two thread rolling dies and applying a squeezing pressure to swage the required thread form without removing any material. There are three methods of doing this. Rolling with flat thread dies is the most common method, either in free-standing machines or with flat dies incorporated into a transfer header. Where difficult materials are being rolled, the circular thread dies are more common. These allow a longer distance to be travelled to form the thread so the deformation can be more gradual. For very high production rates, planetary dies are used, but these dies are more expensive than other types and are usually employed on lower carbon steels. Bolts, screws and studs with cut threads are produced by machining metal from the body of the fastener on a lathe or CNC machine. This process is often used for lower volume production runs, intricate threaded parts or material that is too hard to thread roll. There is no favourable grain flow produced and no work hardening, but this method can produce a thread that complies with the requirements of the standards for mechanical property and is an acceptable method of making many parts. 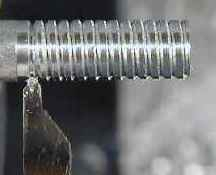 There is a method called thread forming that uses a tap that does not cut the metal but forces it into a thread shape. The benefit is that the threads are work hardened, so they gain in mechanical properties, and there is also no machining waste, the thread is not as well formed as a cut thread, and lubrication is critical to ensure there is no metal adhesion. This method does not suit more highly alloyed or high strength materials. 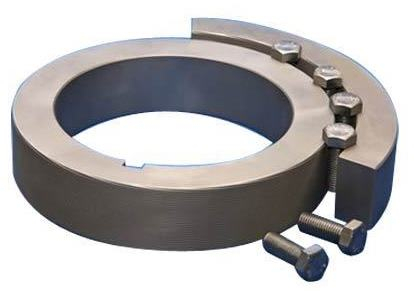 Nuts and fastener products with internal threads are usually machined by a tapping process. The process of forging the nut blank provides a pierced hole that is the location for internal threads, and the tool that machines the threads is called a cutting tap. The most common high production tapping process uses a ‘bent shank tap’, and is continuous, so it is fast. After the nut is tapped, it feeds down the shank of the tap and exits from the bend in the shank. An alternative, much slower method is an ‘in-and-out’ tapping method where the tap reverses rotation after tapping the thread, to back out of the nut. This method is used for smaller production quantities, and also for materials that are more difficult to tap.